Mental Health Foundation exists to help people survive, recover from and prevent mental health problems. We bring together teams that undertake research, develop services, design training, influence policy and raise public awareness within one organisation. We are keen to tackle difficult issues and try different approaches, many of them led by service users themselves. We use our findings to provide high quality information, publications, training materials and online services for statutory, voluntary and community organisations, and for the general public. We also work to influence policy development, including Government at the highest levels. And we use our knowledge to raise awareness and to help tackle stigma attached to mental illness and learning disabilities. We reach millions of people every year through our media work, information and online services. 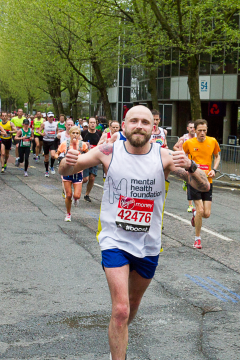 We will support you every step of the way including fantastic fundraising and training tips, pre-race and on the day reception. Join our winning team and help make a difference to people's lives.